A well-trained dog means having better control over him on your walks. This can be achieved through training, but appropriate walking equipment can be just as helpful. Recent studies explained how different types of dog harnesses are better than a simple dog leash due to their safety and comfort for the pet. However, because every different dog harness has its own set of unique features, owners feel confused and unsure which design will work best for their canine. Before you set out to purchase your next walking dog harness, this guide will explain the differences between three main types of dog harnesses – front-clip, back-clip and dual clip (or multi-clip), pros and cons of each, how they compare to each other and which type may be better for your pooch. We'll also talk about the styles of over-the-head and step-in dog harnesses. Harnesses with a front clip have the leash attachment placed in the center of a dog’s chest. These types of dog harnesses are often used by trainers because they provide plenty of control and help trainers (or owners) stop dogs from pulling on the leash too much. Thanks to the front chest clip, owners have more control over their dogs and the direction in which their pets are moving. The front-clip dog harness type. The front-clip dog harness provides the most control due to the positioning of the clip. 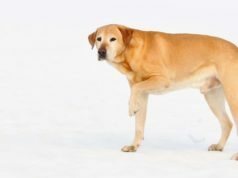 Instead of pulling your dog away (back), because the clip is on the pet's chest, an owner can pivot the dog (turn to the side) with a slight pull, usually causing the dog to turn toward the owner. More control over leash pulling, jumping up and other bad leash behavior. Directional steering and help with turning the dog around when needed. Even though front-clip types of dog harnesses offer more control compared to the most back-clip harnesses or traditional leash and collar, strong, heavy and large dogs that have serious behavior issues will probably require a walking tool that provides additional control, like a head halter. Since the leash goes in front of the dog's chest, pets may often get tangled and stuck with their front legs if given too much slack. Putting on the front-clip dog harness on your pet is slightly more complicated for the owner compared to the back-clip harnesses. Eagloo Front-clip Harness – very affordable front-clip dog harness with a standard halt ring on the chest. It comes with four adjustment buckles. Comfortable enough for short walks, but not for prolonged walking (especially for strong pullers) due to simple nylon material without extra padding. It has reflective material which is great for walking during early mornings or later hours of the day. With the back-clip types of dog harnesses, the ring to which the leash clips onto is always located on the dog’s back, hence the name back-clip harness. These pet harnesses are the most popular among owners because they are easy to put on, and dogs adjust to them better than to other types of dog harnesses. The back-clip types of dog harnesses. 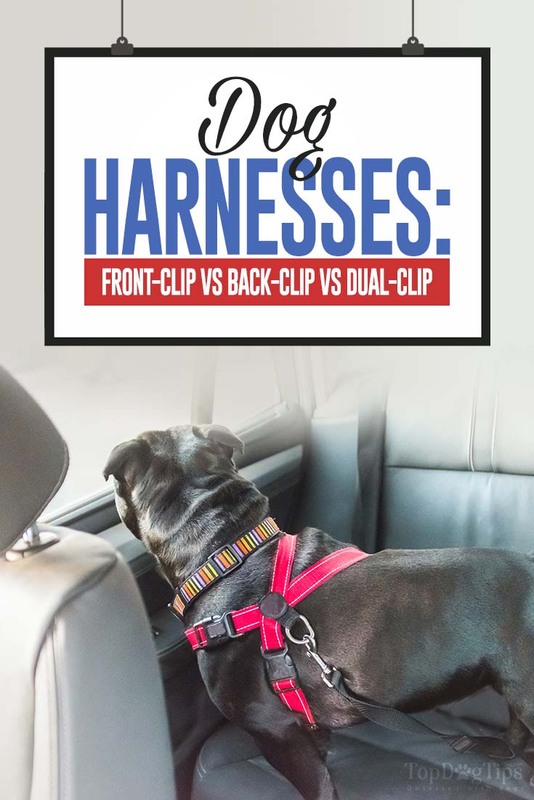 The back-clip harness is particularly useful for small breeds since they have delicate throats which can easily be harmed by collars or improperly placed front-clip harnesses. However, back-clip harnesses are not the best choice for untrained dogs who like to pull on the leash strongly and often. Very simple and easy to put on your dog, and dogs quickly get used to it. Comfortable for dogs to wear and keep the delicate neck area protected. The leash rarely gets tangled under the dog's front legs. Most popular types of dog harnesses among pet owners, which means that there are many different styles and patterns to choose from. Do not provide enough control over bigger dogs with serious walking issues, particularly pulling on the leash or jumping up. Not recommended for aggressive dogs due to lack of proper control. Do not offer any directional steering. Voyager All Weather Mesh Harness – A very affordable and simple back-clip step-in dog harness made with breathable mesh material and extra padding, great for all types of weather. For extra security, it has both a standard D-ring and strong Velcro straps. It can be purchased in over ten different colors and for dogs of all sizes. At this price, it's the best back-clip harness option available. Some types of dog harnesses come with attachments on both front and back and they are called dual-clip harnesses. There are even harnesses that come with three, four and more attachment points (both in the front and in the back), called multi-clip dog harnesses. These are often used by dog trainers but more pet owners are starting to pick them too, now making these types of dog harnesses the most popular on the market. The dual-clip types of dog harnesses. The back-clip allows guiding when on normal walks and the front-clip is used when more control is needed in case that the dog starts pulling or jumping. In most cases, these dual-clip dog harnesses also have a handle in the middle for direct control of the dog. Triple-clip dog harness with a handle. Recently became the most popular types of dog harnesses owners purchase. Has all the advantages of both front- and back-clip dog harnesses. Pressure is applied evenly, on multiple points, which can prevent injuries caused by a yanking motion. Best at teaching dogs with behavioral problems not to pull on the leash. Comfortable for dogs to wear and easy to adjust. Dual-clip is more expensive than other types of dog harnesses. Due to extra clip points, some dual-clip harnesses can cause discomfort (rarely). Not recommended for long-term use due to dependency on the harness. It's better used as a training tool, not regular walking equipment, because pet owners must teach dogs how to walk on a leash safely without relying on the harness. Ruffwear Front Range Harness – The best rated dog harness out there from a reputable company specializing in outdoor dog gear, but also one of the most expensive options. This dual-clip harness is great for strong pullers, has two leash attachment points and made of comfortable material with padded chest and belly. It has some extra features such as tuck-ID tag holder and more, and can be purchase in different colors as well as customized for the dog using four point attachments. Another common dilemma pet owners encounter regardless of the choice from three types of dog harnesses above is about choosing how to put on a dog harness. There are two ways (depending on the harness itself) that the harness can be put on a dog, and they're called (a) over-the-head harness, and (b) step-in harness. Either one of the above mentioned dog harness types (front-, back-, dual-clip) can be a step-in or over-the-head harness. But which one should you choose and how they differ? Often called the standard dog harness, as the name implies these types of dog harnesses go over your pooch's head first. This is usually very easy to do, especially if you have a calm dog who doesn't mind the process. Thanks to the neck enclosure, these types of dog harnesses offer a good weight distribution and complete body control. Also, thanks to the adjustable shoulder straps, your Fido will have additional neck protection. How to put on over-the-head dog harness. The over-the-head dog harness style is often chosen for small dogs and well-behaved dogs with low-energy, but it can still be used on dogs of any size, age or breed. The standard over-the-head harness requires a 2-step process to take place (placement over the pet's head and then body strap) that takes slightly longer, which may not be the best for dogs without patience. These harnesses, as the name implies, require your dog’s legs to go in first. It is a simple option in which you lay the harness flat on the ground and make your Fido step in the two holes separated by the square or perpendicular strap in the middle of the harness. After that, you just pull the sides up and snap the closure, usually on your dog’s back. How to put on a step-in dog harness. These types of dog harnesses are best suited for obedient dogs, regardless of their size or shape. But even with less obedient dogs, some pet owners and trainers still find step-in dog harness to be easiest and quickest to put on (while others prefer the ease of use of over-the-head harness). This harness style can be easily adjusted to fit any dog, too. I can never find the adequate harness for my pup either too small or too big it’s frustrating. We need a place where our pets can be properly fitted .. lol no seriously we do.